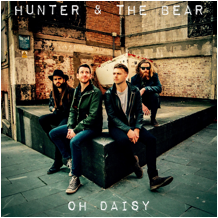 ‘Oh Daisy’ is the brilliant new single from Hunter & The Bear, a band currently setting the gold standard of the contemporary UK rock scene. From quality airtime on taste-maker Bob Harris’s BBC Radio 2 show, to an unbeatable slot supporting Eric Clapton on his recent arena tour, the band’s deft employment of hard rock riffs and melodic song-craft has seen them championed by some of the biggest names of the rock and roll canon. One of only a handful of contemporary bands with the requisite musicianship to rejuvenate the UK’s proud heritage of guitar led music, ‘Oh Daisy’ is the latest indication that Hunter & The Bear have not only taken up the baton but have run away with it. A knockout hit of power and emotion, ‘Oh Daisy’ delivers as much force in its electrifying instrumentation as it does in its anthemic chorus. 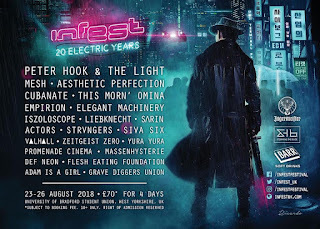 All the band’s celebrated hallmarks are there: the bold and biting guitar tones; the richly textured harmonies; and of course the epic and soaring melodies that are confidently delivered by front man Will Irvine, a singer who possesses true vocal maturity. The single resonates with the particular energy of a band who, in true rock and roll fashion, honed their talent on the road. One of the hardest working bands around, Hunter & The Bear have spent most of their time together tirelessly gigging across the country, setting venues alight at each and every stop. Between their acclaimed festival performances at Reading, Leeds, and Loopallu and their sell out ‘Highlands and Islands’ tour, in recent years the band have accumulated a vocal legion of fans that are as enthusiastic as they are loyal. As much as the band’s roots run deep in the traditions and timbres of rock and country, ‘Oh Daisy’ has all the qualities of a modern classic. Rather than chasing the limelight or aping the latest trends, Hunter & The Bear have found a fresh sound and dedicated following by staying true to great music that inspired them. ‘Oh Daisy’ shows Hunter & The Bear doing what they do best: creating exciting, breathless, organic rock that lights the fire in your belly and stirs the soul. ATTILA issue a "Public Apology" - Listen!